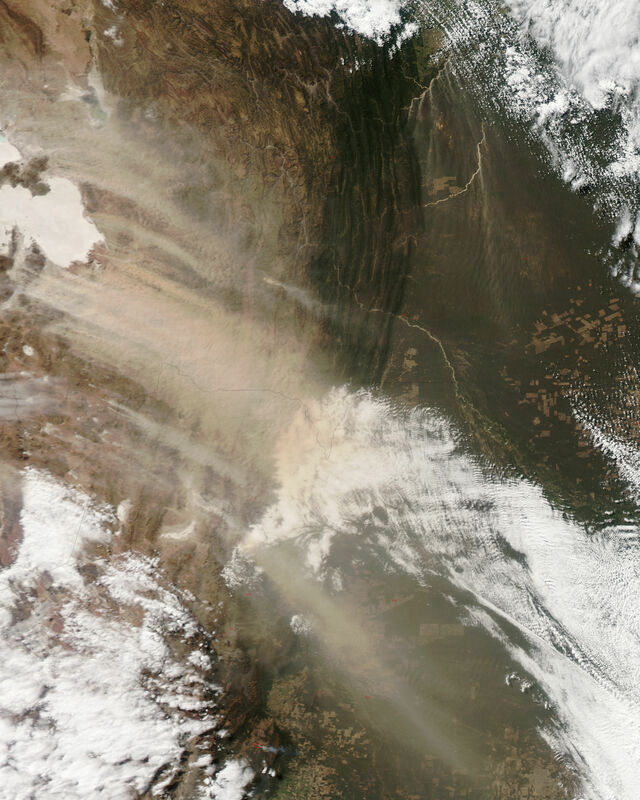 Dust blew across southern Bolivia on July 21, 2009, as the Moderate Resolution Imaging Spectroradiometer (MODIS) on NASA’s Aqua satellite passed overhead. 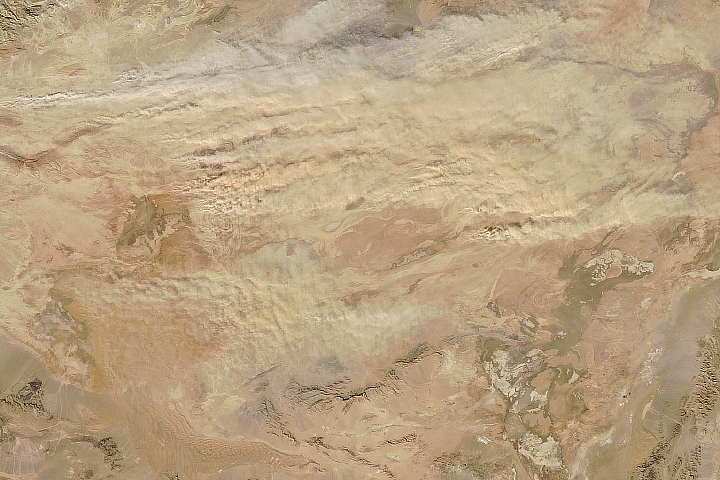 Many of the dust plumes were thick enough to completely obscure the satellite’s view of the ground surface below. Most of the plumes arose from or near Salar de Uyuni and its neighbor, Salar de Coipasa, two salt flats resting atop Bolivia’s Altiplano, or elevated plain. Dust plumes from the salt flats blow toward the southeast in this true-color image. Farther east, however, smaller plumes arise from the riverbeds of Rio Grande and Rio Parapeti, and head almost straight south. Two sets of waves appear in this image, but they owe their existence to different sources. Running vertically through the center of the image are the folded strata of Bolivia’s mountains, and the rocks in these folds range in age from Precambrian (more than 550 million years old) to Tertiary (less than 65 million years old). East of this rugged landscape, the land surface is smoother. The wave patterns south of Rio Parapeti result from airborne dust. The cloud bank over Argentina also displays wave patterns. Salar de Uyuni is the world’s largest salt pan, covering some 8,000 square kilometers (3,100 square miles). Like Salar de Coipasa, the salt flat lacks drainage, so water entering the area can only evaporate, leaving minerals behind. Isolated red outlines show where MODIS has detected anomalously warm surface temperatures, probably from agricultural fires or wildfires. This true-color image from July 21, 2009, shows pale beige dust plumes blowing southeastward from salt flats in western Bolivia. 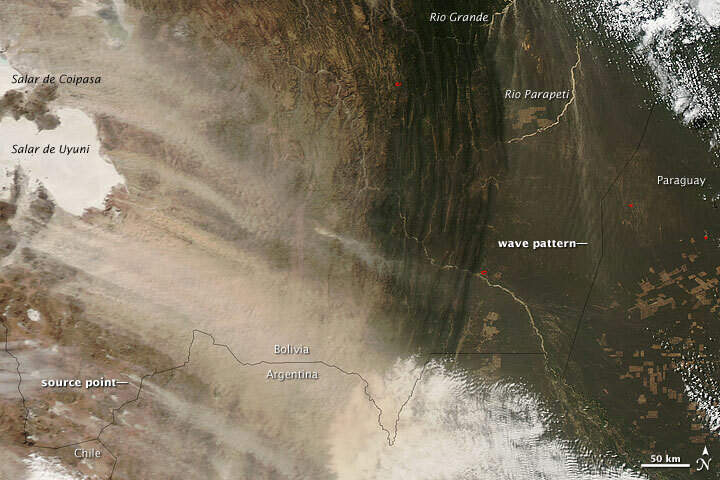 The image also shows small plumes blowing southward from riverbeds in eastern Bolivia. About.com. (2009). Geologic Map of Bolivia. Accessed July 22, 2009. Earth Observatory. (2005, December 12). Salar de Uyuni, Bolivia. Accessed July 22, 2009. Wikipedia. (2009, July 18). Salar de Uyuni. Accessed July 22, 2009.